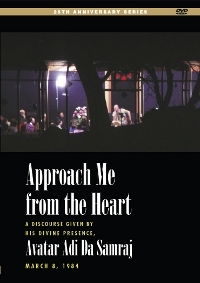 In this lively and intimate discussion, Adi Da Samraj eloquently addresses several questions, including “What are the fundamental emotional-sexual limitations of beings in this realm?” This DVD also provides an excellent example of the devotional relationship between Avatar Adi Da and His devotees. What is a Divine experience? Who is God that God could be identified over against anything whatsoever? And who is a Spiritual Master if He can find Himself apart from God, such that He could say: “This piece is Me and this piece is God”? How could such distinctions continue in the consciousness of one who has Realized the Divine?